Every situation required a new specially adapted mask to portray the feelings outwardly that were expected from a growing close knit family. Sometimes her face would light up with happiness at a certain milestone. The first words, the first step, then there would be an almost natural expression of maternal pride and satisfaction. Then at times the face would be a gentle face, that masked the tears inside, after a hurtful thoughtless cruel remark hit hard, penetrating to the core of her being. Many times the angry, irate mask would be donned in response to a perceived threat to the children or the home. Then the protective mask would be applied and the voice would be altered to reflect the anger and to defend her family. 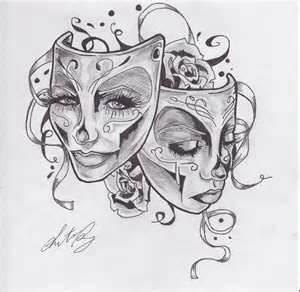 All her world was a stage and she developed a mask to reflect the required response to every possible situation. Instantly adaptable, instantly altered. It would only be after many years of caring and protection in the background, often taken for granted. A Mother would be lost and sincerely mourned and missed.